$0.40 /night for anyone over 18 years of age, included. $12 /night up to maximum occupancy. A 25% deposit is required with booking and the balance is paid on arrival. Cancellations made within 6 weeks of arrival date are non refundable. Exit the N249 at the first sign for Bressuire. Come down the hill towards the town centre. After passing the bridge, make a right. The signs will say Fontenay Le Comte. After about 400 metres, there will be a mini roundabout. Take the 1st exit onto a larger roundabout with a garden centre opposite. Follow the sign for Fontenay Le Comte, pass under another bridge and turn right 100 metres later. Make an immediate left turn after the right. The campsite entrance is 25 metres up this road on the left. Follow the road up the hill to the reception by the barrier. Follow the signs for Fontenay le Comte until the roundabout with a garden centre. Follow the signs for Fontenay Le Comte and pass under a bridge. Then turn right 100 metres later and make an immediate left turn. The campsite entrance is 25 metres up this road on the left. Follow the road up the hill to the reception by the barrier. Follow the signs for Fontenay le Comte until the roundabout with a garden centre. Follow the signs for Fontenay Le Comte, pass under a bridge, and turn right 100 metres later. Then, make an immediate left turn and the campsite entrance will be 25 metres up this road on the left. Follow the road up the hill to the reception by the barrier. Puy Rond Safari Tents is a lovely property, just a short walk from the town of Bressuire. The town has numerous shops, restaurants, cafes and bars, and there is plenty to see and experience. 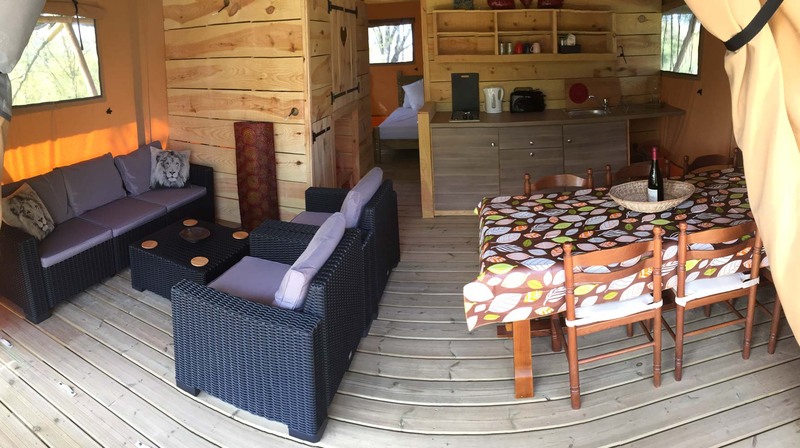 The campsite is only a short drive from many places of interest such as Le Puy du Fou, Le Marais Poitevin (green Venice) and the Japanese gardens of Maulevrier. Futuroscope and the Loire valley towns of Saumur & Chinon, the vineyards of Anjou & Muscadet, and the Vendee coastal towns of La Rochelle & Les Sables d’olonne are all around an hour away from the campsite. An ideal choice for visiting the surrounding area and enjoying outdoor living in comfort, each Acacia Chalet consists of one bedroom with a Full size bed, one bedroom with a bunk bed, and a dining/living room with a sofa bed, tables, and chairs for six. The lodge has a decked verandah with BBQ as well as tables and chairs overlooking a wooded valley, bringing nature to every meal. Located in the Nouvelle Aquitaine (formerly know as le Poitou-Charentes), the campsite is in the 2nd sunniest region of France. Sitting on a raised deck, the Safari tent has everything guests will need for a true glamping experience. This is an ideal choice for those who love to camp with added comfort. Each tent consists of one bedroom with a double bed, one bedroom with two single beds, one cabin bed with a double bed and storage under, and a dining/living room with sofa, table, and chairs for six.